The FORMULA 1 PIRELLI 2018 UNITED STATES GRAND PRIX has arrived and excitement for one of the biggest events of the year is building as the main event draws closer! 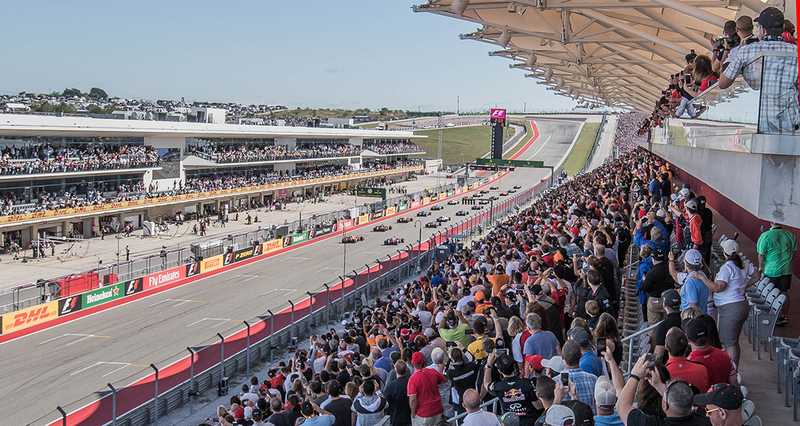 Last year’s F1 USGP once again welcomed hundreds of thousands of visitors to Circuit of The Americas (COTA) to witness MERCEDES AMG PETRONAS F1 Team driver, Lewis Hamilton, clinch his sixth USGP win—and fifth at COTA. Now, he once again returns as the favourite to win at America’s only Formula 1 track with a chance to secure his fifth World Driver’s Title at the same time, mirroring his achievement in 2015 when he clinched the world title here. No doubt his closest rival, Sebastian Vettel – the only other driver to have ever won at COTA – will do all he can to spoil Lewis’ party and keep his increasingly slim hopes of winning this year’s driver championship alive. Furthermore, Red Bull Racing’s Max Verstappen will have something to say about who ends up on that top podium as he bids to banish the memories of his controversial last gasp penalty that kept him out of the top three last year. Whatever happens, one thing is for certain: the FORMULA 1 PIRELLI 2018 UNITED STATES GRAND PRIX is shaping up to be another incredible race weekend here in Texas. Two of the biggest names in music will be the headliners at the FORMULA 1 PIRELLI 2018 UNITED STATES GRAND PRIX. Global superstar Bruno Mars will perform on COTA’s SUPER STAGE on Saturday, Oct. 20th after Qualifying has finished on track and international pop icon, Britney Spears closes out the weekend on the same stage on Sunday, October 21st, following the F1 USGP race. Bruno Mars will light up the Saturday night of the Grand Prix weekend when he makes a stop at COTA with his entertainment-packed 24K Magic World show. The 27-time GRAMMY Award nominee and celebrated singer, songwriter, producer, and musician has sold more than 180 million singles worldwide, making him one of the best-selling artists of all time. Recently, his critically acclaimed and RIAA certified double-platinum album “24K Magic” marked his highest first week sales debut, remaining in the Top 10 on the Billboard 200 for an impressive 44 consecutive weeks. The lead hit single “24K Magic” is certified four times Platinum by the RIAA. International pop icon, Britney Spears will close out the weekend’s celebration with a post-race concert on Sunday, October 21. As her “Britney: Piece of Me,” upcoming world tour is kicking off this summer, which follows her award-winning and record-breaking headlining Las Vegas residency, Spears solidifies the star-powered race weekend. The multi-platinum Grammy Award-winning singer is one of the most successful and celebrated entertainers in pop history with nearly 150 million records sold worldwide. Her musical career boasts countless awards and accolades, including six Billboard Music Awards and Billboard’s Millennium Award, which recognizes outstanding career achievements and influence in the music industry. Featured performers include the prolific 16-year-old rapper love-sadKiD. Hailing from Irving, Texas, love-sadKiD is a lovestoned lyricist and a poet with a microphone. Austin-based singer, songwriter and guitarist Erika Wennerstrom (of Heartless Bastards), receiving praise from Rolling Stone, Time and New York Times, joins the weekend along with local blues band Nakia & the Blues Drifters. The Drifters have shared stages with B.B. King, Willie Nelson and Sharon Jones & the Dap Kings. Jakubi, the Australian quintet, will keep the party going with a mixed vibe of pop, R&B, hip-hop, rock and soul music along with Southeast Texas country duo Mayeux and Broussard. Performing this year’s National Anthem will once again be Retired Navy Petty Officer, 1st Class, Generald Wilson. After last year’s successful debut, 2018 will once again see the return of Haas Hill, where fans can experience the USGP and cheer on the home team as Haas F1 Team is the only American team in Formula One. The Haas Hill experience proved so popular last time around that it has already sold out for this year’s installment. Providing home fans with three-day general admission to see the fastest racecars in the world practice, qualify and compete in the only Formula 1 race in the United States, this ticket also includes access to the Bruno Mars concert on Oct. 20th and the Britney Spears concert on Oct. 21st. Haas Hill is a dedicated fan zone located between Turns 18-19 of the 3.426-mile (5.513-kilometer) circuit. Fans purchasing a ticket receive a Haas F1 Team scarf (voucher redeemed onsite at the Haas Hill tent) and an exclusive appearance by Haas F1 Team drivers Romain Grosjean and Kevin Magnussen, team principal Guenther Steiner, and team owner Gene Haas. All will be available for a question-and-answer session, with a Haas F1 Team photo following that all fans on Haas Hill are welcome to join. For the second year running, COTA is partnering with The Texas Lottery, OSD (Operation Supply Drop) and Honor Flight Austin to host a massive ‘Thank You Deployment’ for 500 military community members at Sunday’s race day of the FORMULA 1 PIRELLI 2018 UNITED STATES GRAND PRIX. OSD is a global, chapter based, Veteran Service Organisation, providing relevant, relatable and sustainable impact to the Military community through social, professional and service-orientated programs. Since 2010, OSD has impacted more than 600,00 members of the military community through these programs. OSD has been working with COTA since 2016, partnering with its sponsors, to fulfill social responsibility and philanthropic efforts aimed at supporting the greater veteran and military community in Central Texas. This partnership has allowed hundreds of veterans and their families access to events via the support of COTA’s corporate sponsors including The Texas Lottery. Last year, attendees, including Veterans from all U.S. Military branches and numerous families, enjoyed premium seats where they enjoyed the open-wheel action up close. After the racing action ended and the sun started setting, many then stayed on to enjoy a truly special concert by the legendary Stevie Wonder. This year, they will once again be able to enjoy watching the greatest racing drivers in the world before heading to the Super Stage to watch Britney Spears close out the race weekend. Join us at the Austin360 Amphitheater on Sunday 21st October for a very special Q&A with the F1 drivers and other key figures in the sport. The F1 Fan Forum takes place on Sunday 21st October from 4:10pm to 5pm right after the race has concluded. Do not miss this amazing opportunity to hear from your favorite drivers! Fans have a chance to meet and receive autographs from each team throughout the weekend in the Austin360 Amphitheater. Make sure to check out the schedules online so you don’t miss out on seeing and getting selfie with your F1 hero! As part of Formula 1’s ‘Future Stars’ program, which – in partnership with FIA - has become a popular part of the pre-race ceremony at all Formula 1 races this season, COTA will identify twenty (20) children to participate in this program. One lucky Future Starwill also be offered the incredible chance to become a Team apprentice with the USGP home team – Haas F1 Team. This ‘apprenticeship’ will take the chosen FIA F1 Future Star behind the scenes and into the Haas F1 Team garage. Speaking to an engineer, the team principle and ultimately one of the driversthis is truly a once in a lifetime experience for these lucky kids. Hop in the driver's seat and see how you hold up against the pros with F1™ 2018, try your hand at an F1 Pit Stop, and much more within the F1 Fanzone. Grandstand & General Admission Tickets Still Available!